For the last several years, all of my paper crafting was done at my dining room table (and we have no kitchen table). Every time I crafted, all my supplies needed to be put away by dinner time. It certainly cut into my precious crafty hours! 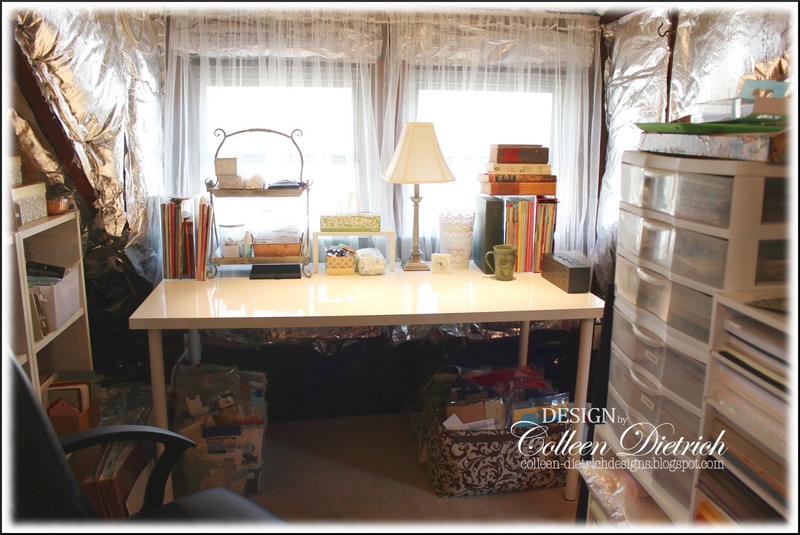 This winter, after our walk-up attic had been insulated, I created a crafting sanctuary there for myself. IKEA and I got pretty chummy, since most of my storage and office components are from them. Love IKEA! I know the silver-backed insulation isn't too pretty, but I tell you....I am SO happy, content and relieved to finally have a space of my own. The lack of usable walls, with tufts of insulation poking out here and there, does not bother me at all. In fact, all that reflective silver actually makes the attic brighter than it ever was. And the best part is the quiet. Upstairs, I cannot hear what happens on the lower levels of my house, and it is peaceful. I've got a space heater, and an air conditioner on wheels, too. Happy dancin'! Let's begin the tour, shall we? After walking up the last step to the attic, this is what you see straight in front of you. Make a right here to get to my desk. Watch your left elbow on the suitcases! These soft chenille throw rugs are from IKEA. The light beige carpet is from our dining room before we renovated. You've made a right turn from the raspberry throw rugs into the main crafting area. All of the units you see here are from IKEA, including the chair (the FINGAL). The two tallest pieces are ALEX , the two small bookcases to the right of them are BILLY, and the two metal drawer units to the far left are HELMER. Here is my desk, also from IKEA (LINNMON high gloss table top, ADILS legs). I assembled most of the pieces myself! I'm feeling mighty proud. :-) Hubby hung track lighting over my desk, attached to a piece of 2 x 4 wood. The sheer LILL curtains are from IKEA (told you we got buddy-buddy!). They're only $4.99 a pair. I just wanted something to soften the hideous old, dirty windows. Got a few essentials here: coffee, a Jambox speaker for music, a small VACKIS clock IKEA (99 cents! 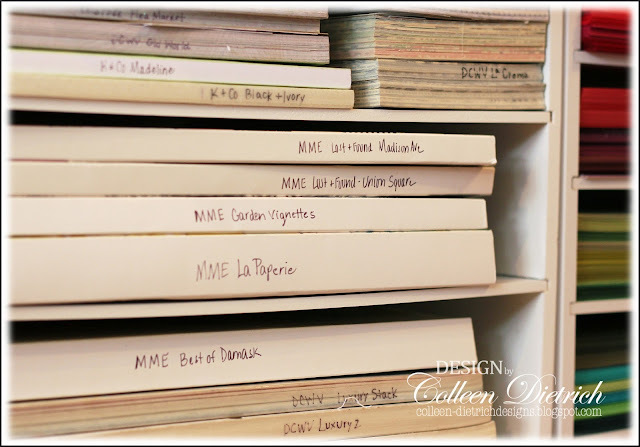 ), magazines for inspiration, old books for their pages to use in projects. The SKURAR candle holder (looks like a lace vase) hides a Yankee Candle Flameless Fragrance Sphere in Lemon Lavender. 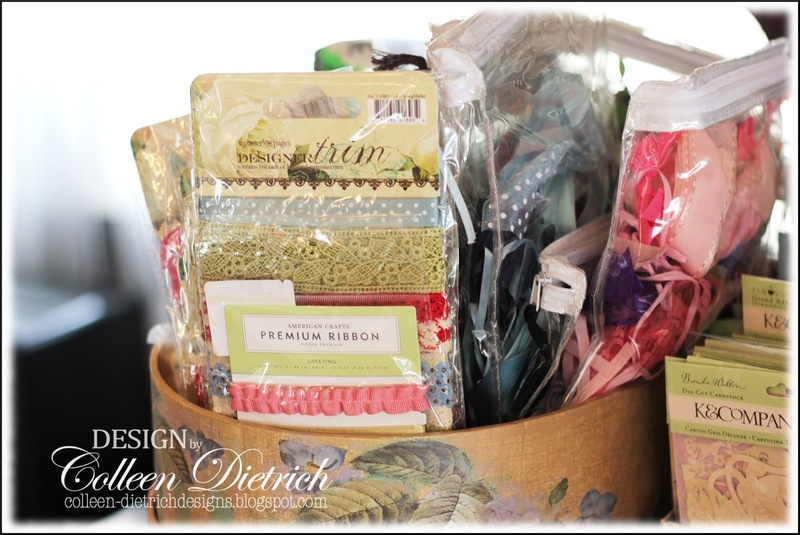 My basket of clear stamping blocks sits directly in front of me, stamp spray cleaner to the left and stamp scrub pads below. 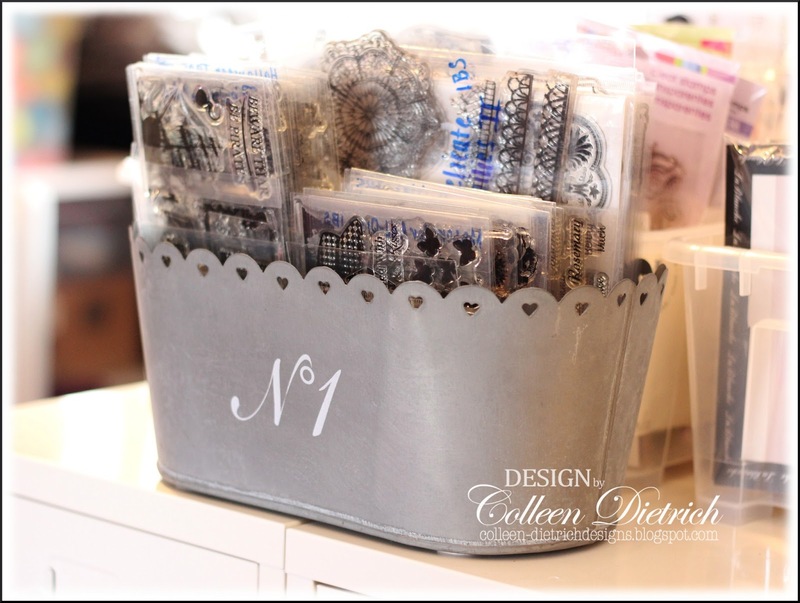 I've got my custom stamp in this basket, too, for using on the backs of all my cards. You can see a picture of the stamp in THIS post. 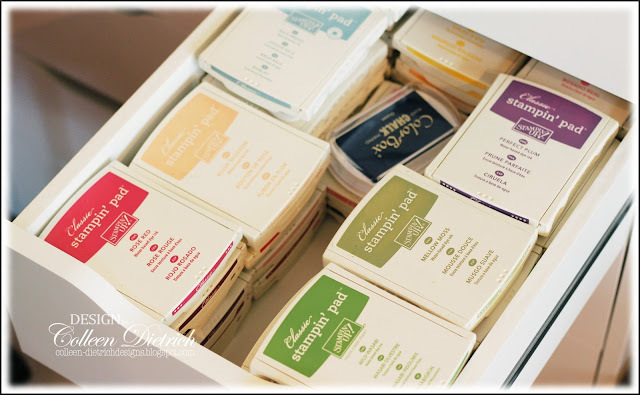 Three former soap boxes now house various punched shapes, most of which are separated into little clear bags. The small box holds stamped images that were never used but may find a home one day. 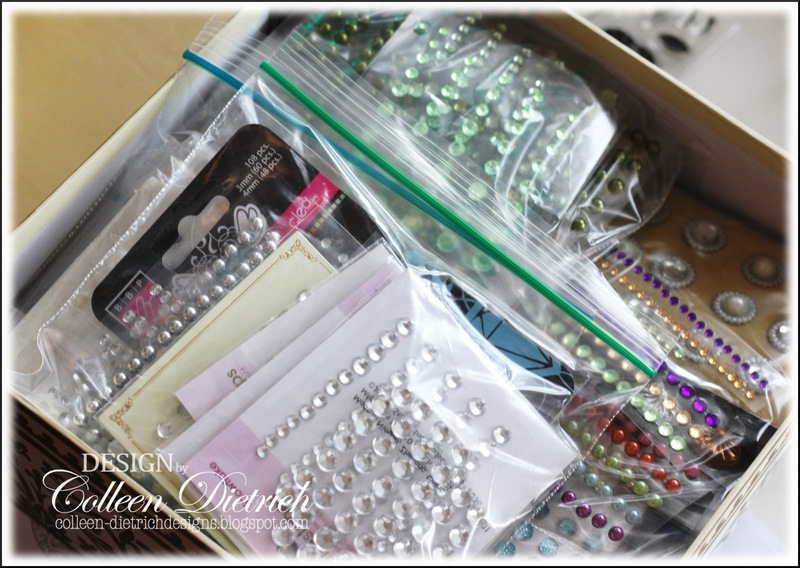 The large box holds most of my gems, separated by color family and stored in zip-top baggies. Because I use pearls most often, there are too many to fit into the other gem box. This plastic tote box came inside a zippered beverage cooler. 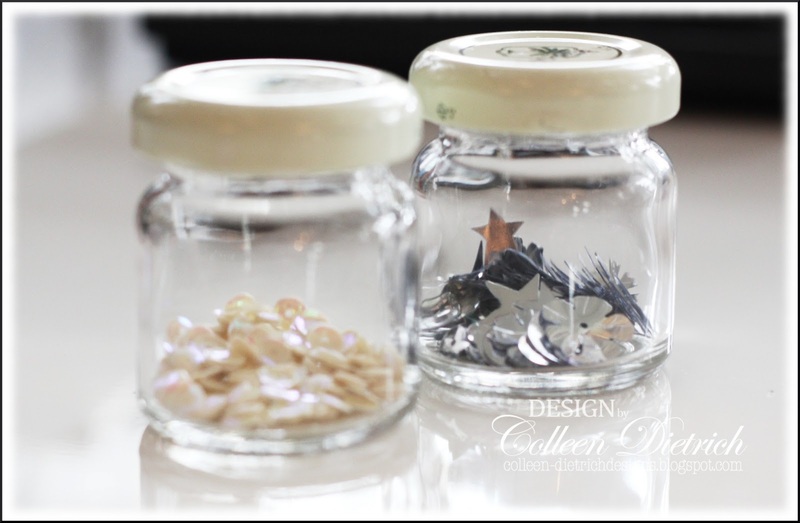 Tiny jam jars from Hawaii, brought home in our suitcase, store sequins. These Stampin' Up! 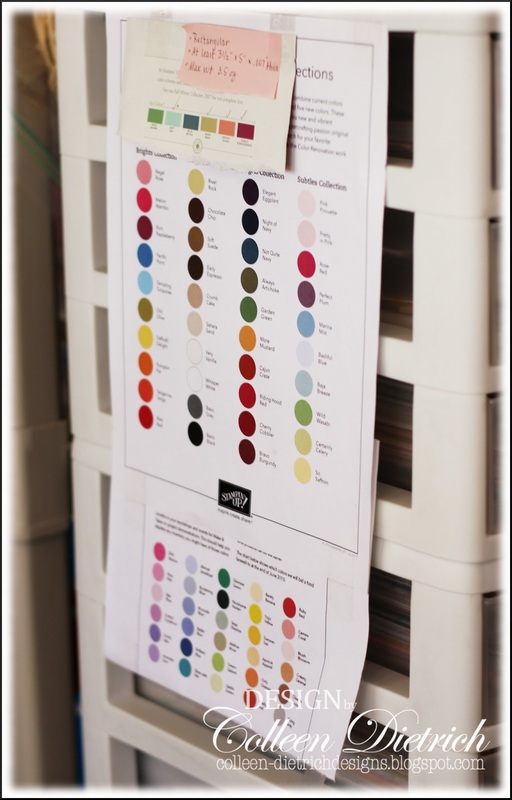 color charts help me easily remember the names of my card stock. All of my card stock scraps are sorted by color family and filed in this large tote from The Container Store. 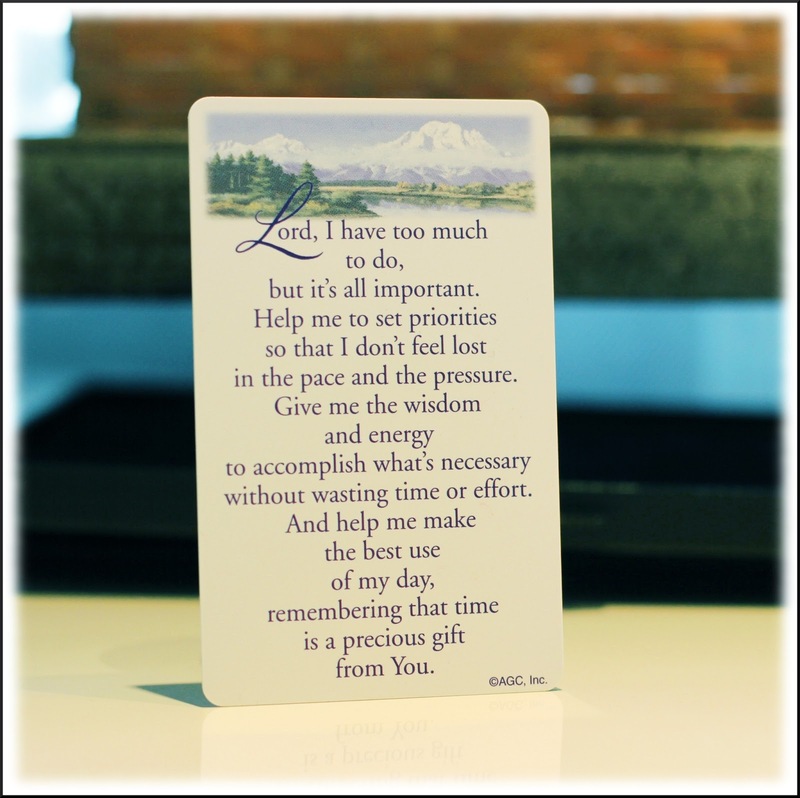 (I could not find this item on their website; must be discontinued) I keep it under my desk. 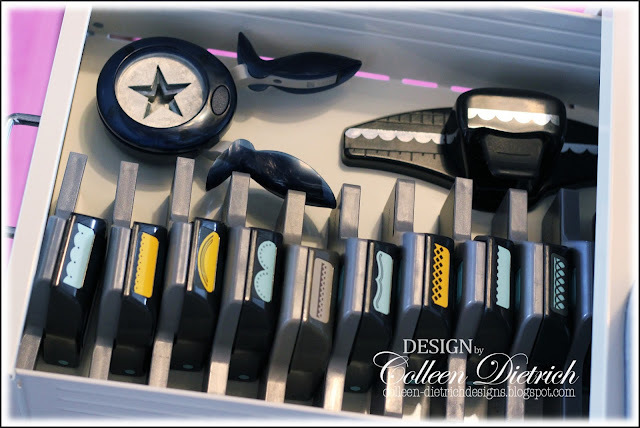 When I crafted in the dining room, all of my dies were held on magnetic vent covers inside an old TV armoire's doors (see THIS post). That armoire would not fit up our stairs, and now I have no walls, so a clever idea needed to happen. My genius husband came up with this adaptation: a large, sturdy piece of foam board in black (got mine from Staples), covered with magnetic vent covers (adhere with double-sided foam tape). If I had walls, I could hang this board perhaps, but I've got it leaning against the end of my kids' toy shelves right near my desk. 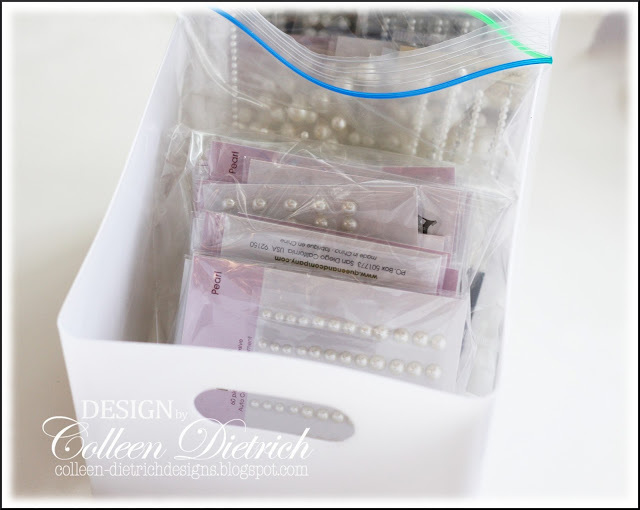 Since I'm an organization buff, I am always on the lookout for little containers and boxes that I can repurpose. This box came in the mail. I trimmed off one side and store my cut-and-scored card bases in it. The box of cards (shown one photo up) is stored on these bookcases, as well as all of my Stampin' Up! stamps and the plastic tote holding pearls. See the purple binder by the floor? Check out the next couple of photos to see what's inside. 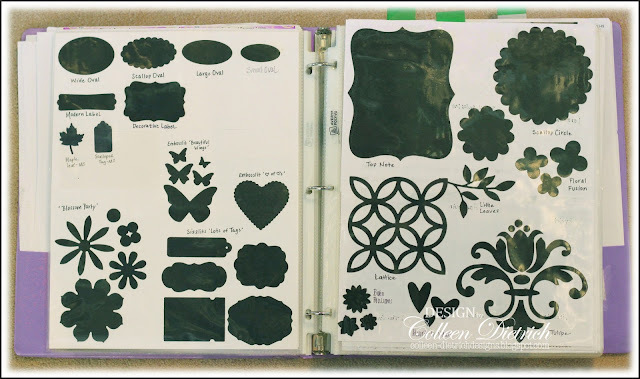 Every time I buy a new punch or die, I make an image in black and add it to these binder pages, along with the name of the product. Spellbinders dies have handy pictures on the package. I just trim and add to the binder. Remember these paper holders from earlier in our tour? They're just a foot or two behind my chair. I record the name of a paper pad on its spine for easy reference. Okay, I'm opening select drawers now so you can peek inside. Anything related to heat embossing goes here, along with a curling iron for getting wrinkles out of ribbons. Liquid Pearls, dye re-inkers, Smooch inks, Crackle Paints and Creative Inspirations Paints go here. All my neutral ink colors are stored here, as well as all Ranger Distress Inks. 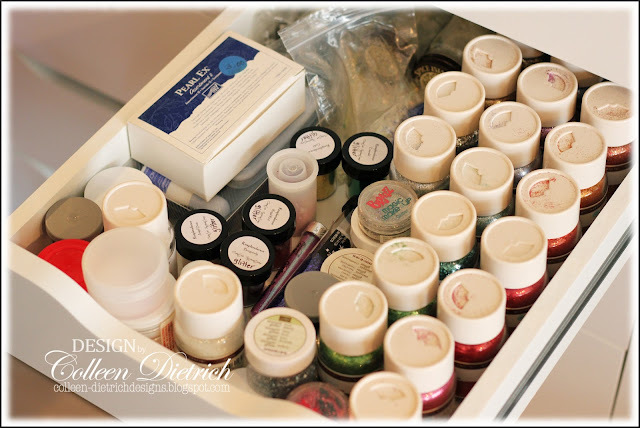 All the other inks call this drawer 'home'. This drawer is deeper than the one containing neutral ink colors. I'm amazed they all fit! I've got three shallow drawers of flowers. This one is dedicated exclusively to my Inspired By Stamping blossoms. 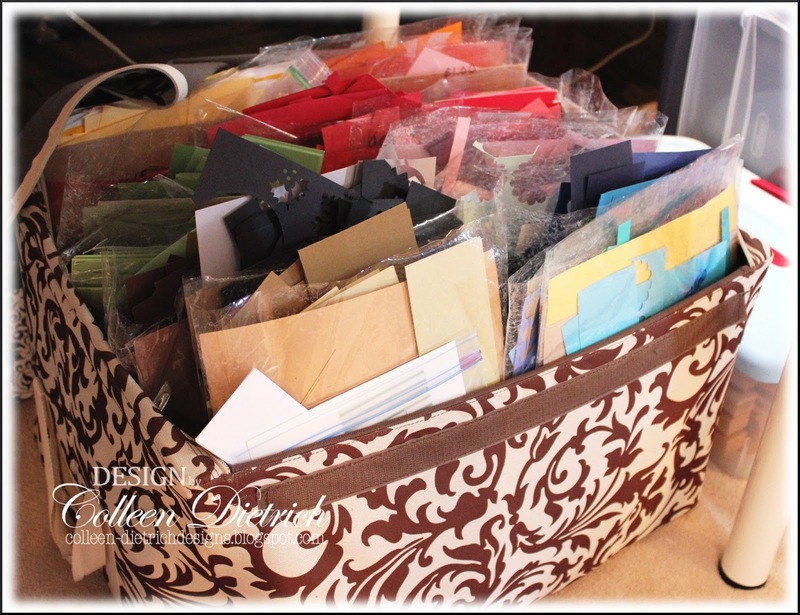 One of several ribbon drawers. This one is full of whites/creams/grays/blacks. 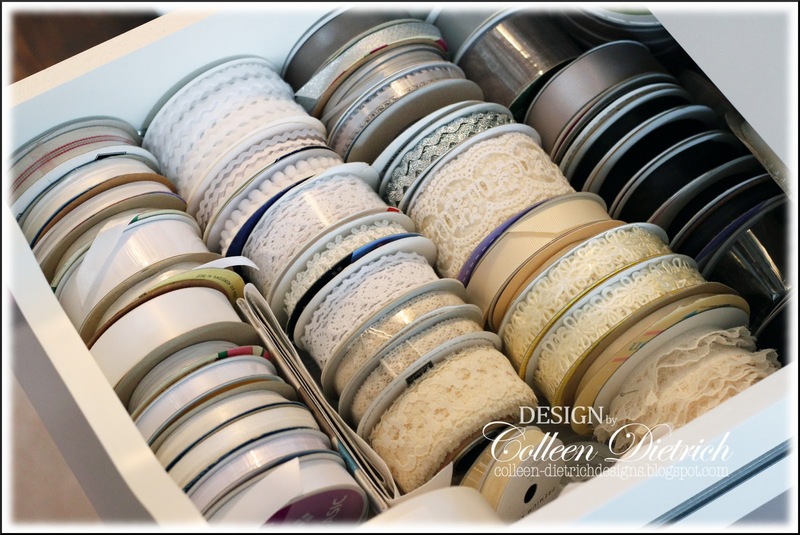 Another ribbon drawer. 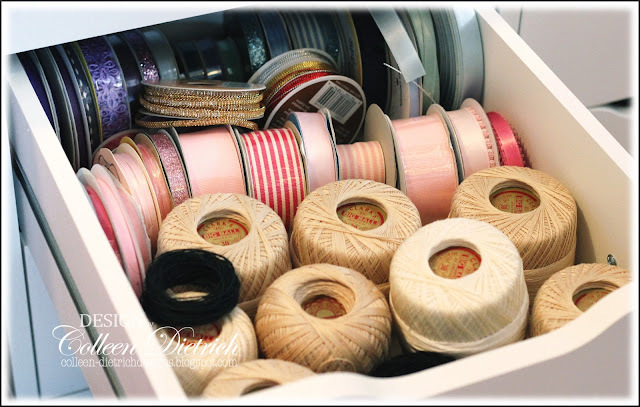 Pink, blue and purple ribbons live here, as well as vintage spools of thread. The two smaller metal cabinets house my punch collection. This is a sample. The tops of storage units work hard, too. 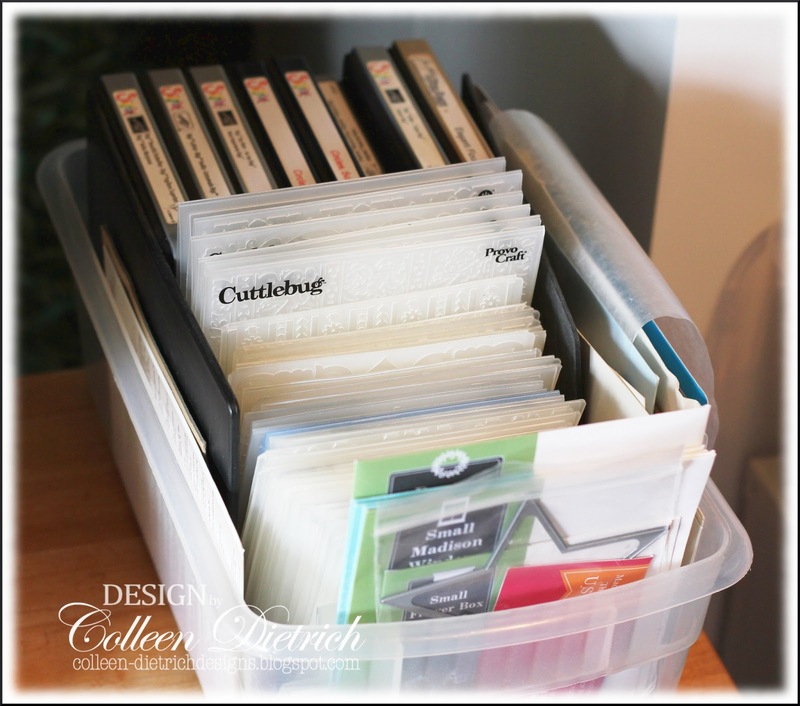 On top of a card stock storage cube, clear plastic SAMLA boxes house clear and rubber cling stamps. Bought this pretty galvanized container a while back at Tuesday Morning. It holds all of my Inspired By Stamping stamp sets. Ribbon scraps - and any ribbon not on a spool - are sorted by color family and stored in zippered curtain bags, then tucked into this pretty hydrangea box. Hang on! We're almost finished, but I've got one more spot to show you. We're back to the beginning of our tour and I have another small area to show you. See straight ahead, behind the small metal cabinets, there's a table peeking out? You can see a bit of the wooden table top and chrome legs beneath the windows. 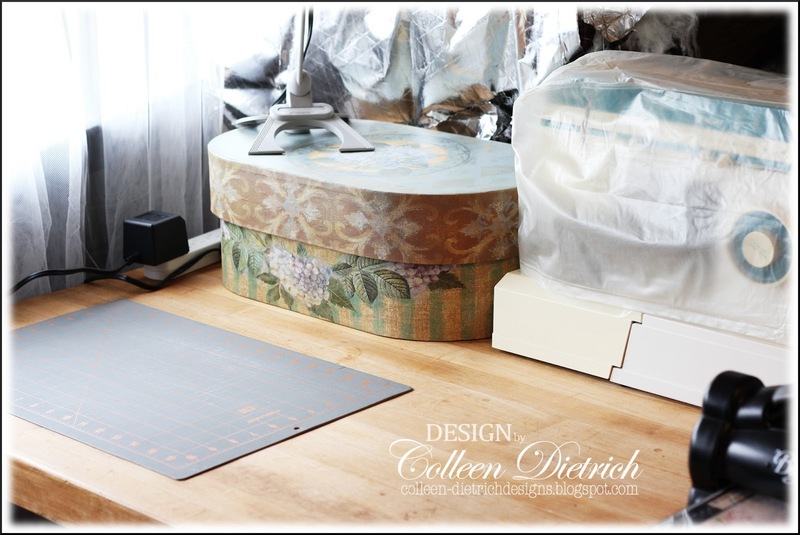 On that table, you'll find my sewing machine, Big Shot and some dies/embossing folders. Back when I crafted in the dining room, I never got out my sewing machine. It was stored in the basement and was mighty inconvenient to get out for a day of crafting here and there. 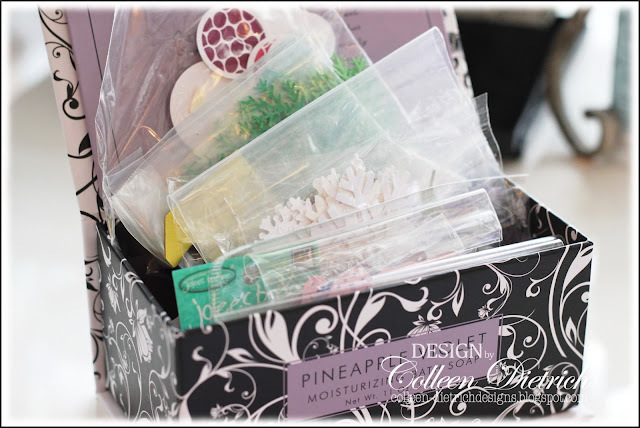 A plastic shoe box holds embossing folders, Memory Box dies, Sizzix Bigz dies. 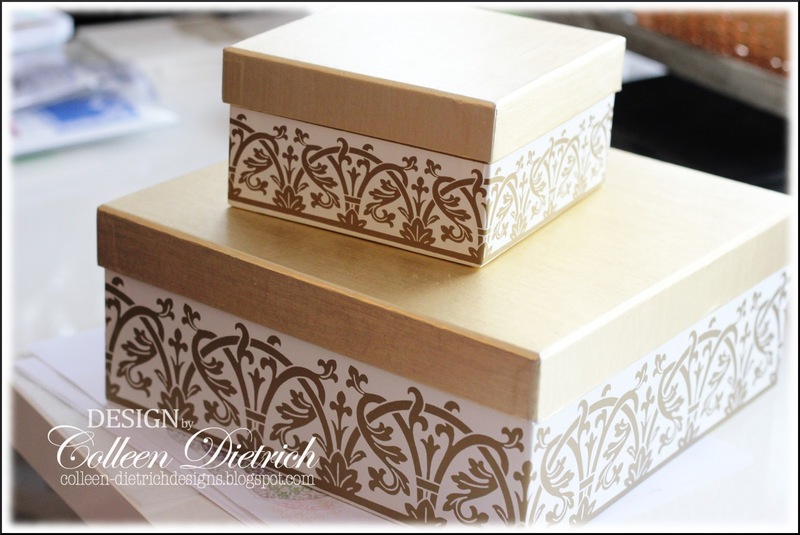 Little Sizzlits dies go in this decorative box, which matches two others I showed earlier in our tour. I'd LOVE to hear what you think! Please leave a comment before you go. I'm happy you allowed me to share my new space with you. Wish you could come over for a cup of coffee, crafting and chatting! :-) I guess this tour is the next best thing. Wonderful tour! Your space looks great and I love all the organization. 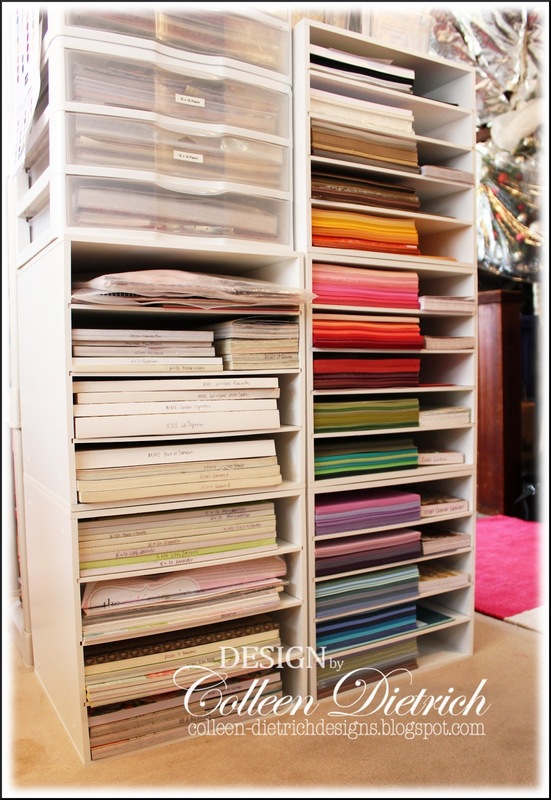 I am an organizational fanatic as well, so I love it!! 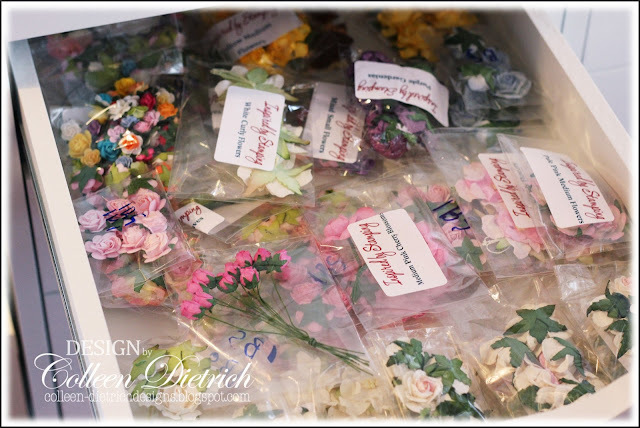 It's wonderful to have your own space...happy crafting! Fantastic use of the space! You are so organized!!! And you made me feel better about my own stash...hihhihihi. Good to know I'm not the only one to stock up on crafty goodies. Such a well organized space...love the tour! Your space looks awesome, well organized. I cannot imagine working at the dining table, I've been lucky to have a small bedroom for my craft space. And it IS mall, but a happy place. You got a whole lot of stuff in your little area - well done!! Looks fabulous and I love how bright and sunny it is :) Yeah for your own space!! Wowsa! I loved several of your ideas and pinned them! Thanks for sharing your space. No wonder you love it Colleen, looks cozy! 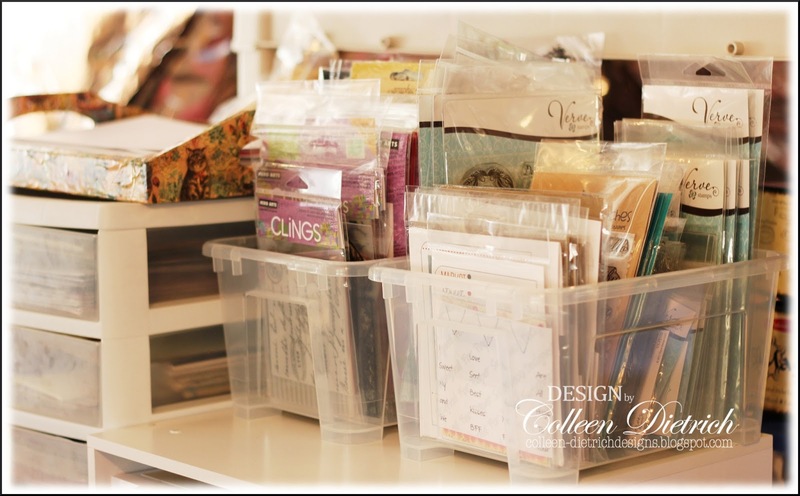 You seem to have great light for your crafting and tons of fun storage ideas. Thanks for the tour and happy crafting!!! 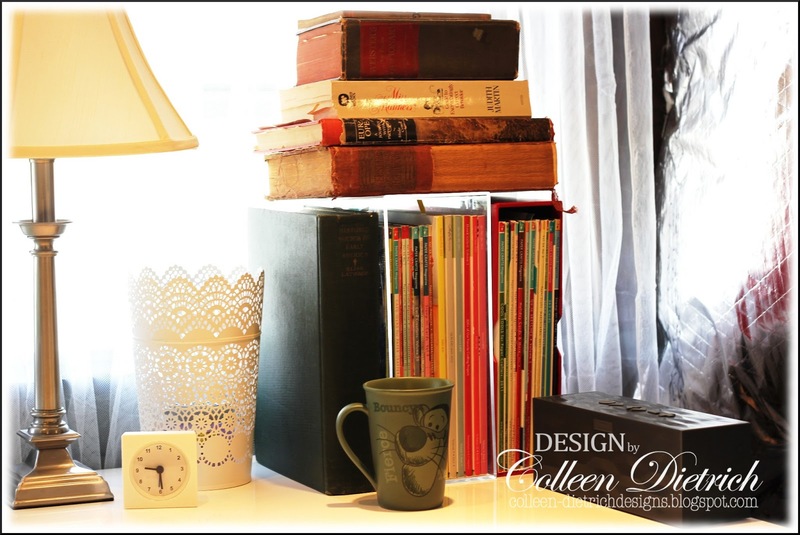 TFS your creative space, Colleen! I am ALMOST ready (one day away, maybe) from having my craft room DONE! Now to put everything back and have room for it all!!! It was interesting to see all your storage options. I can't wait to put some into use in my room too! I just got my own crafting room after years of stamping at the dining room table (with no kitchen table either!) so I understand completely your elation at having your own space like this! What a fab job you've done with organising, I need to take lessons! Fabulous, Colleen...thanks for all the pictures, I can't wait to see it in real life! Yay, you! What a fabulous crafty space! Thanks for the tour! I think being organized and having similar things together helps us know what we have so we can use it. I go thru my stamp sets from time to time just to use some I forget about! Wonderful space & how nice you have your own spot! Love your organization! Thanks for sharing! How fun - very cool tour - almost felt like I was right there - wouldn't that be fun! Some day we have to do that! 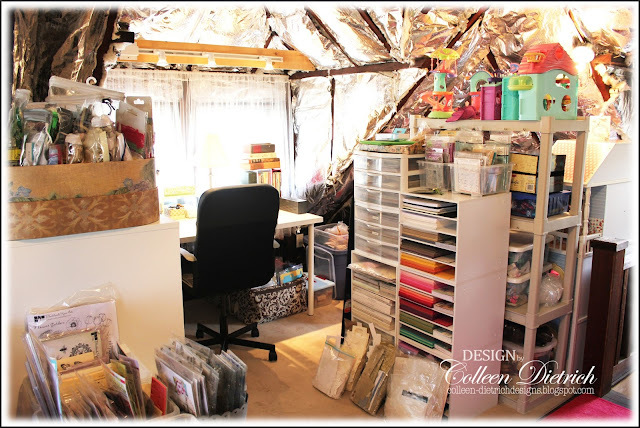 Give me a month or two and I will do a tour of my craft space (as soon as Crystal's stuff gets out of my craft room - LOL). I need to show my DH a few of these things (so he realizes there are others like me out there and because I love some of your ideas). 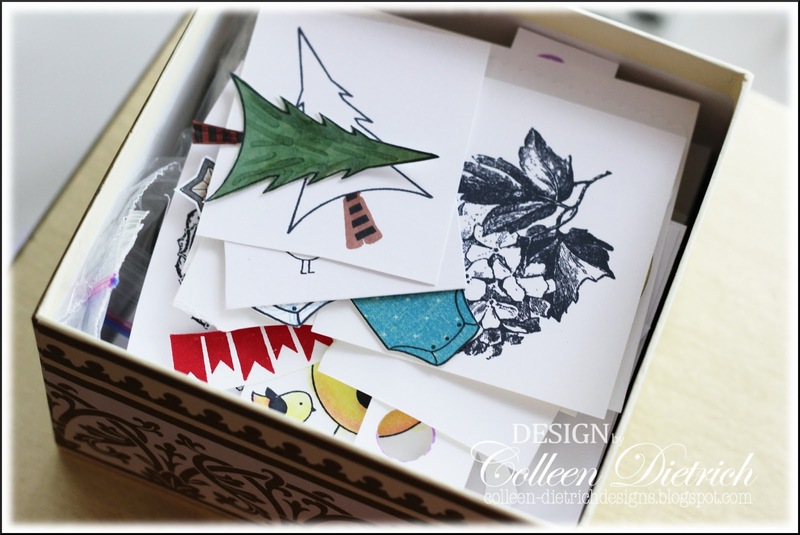 Thanks for sharing Colleen - wonderfully done and congrats! Hugz! Thanks for the tour. Your new crafting space looks fabulous. Inside every woman is a little girl who wanted a playhouse of her very own. A place to read, write, study or use as a retreat for rest. I think it's vitally important for our overall well-being. Most women are so busy with the business of the day they rarely have time to pursue creative pleasures. I'm so glad you have that space now. Here's to quite moments and beautiful creations - I lift my coffee cup! I think I would go up into the attic, shut the door, and never leave! This is such a FABULOUS space! I see the creativity just oozing out of the insulation! LOVE it! THX for the tour! You are so organized!!! Congratulations on your new scrap place. How wonderful. I know what you mean about getting away in your own little space being so peaceful. 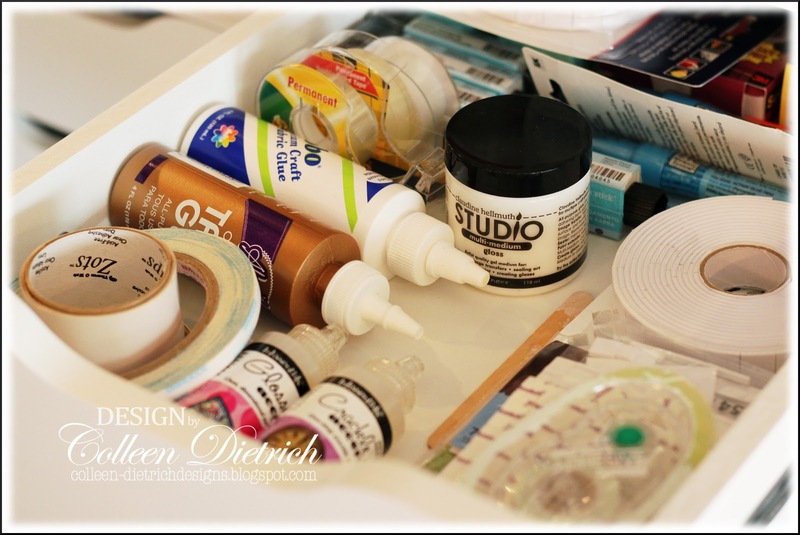 Love all your beautiful cabinets to store your things. Enjoy!!! P.S. Are you still working PT? Yea...your own space to create. Super well organized and overflowing all ready. 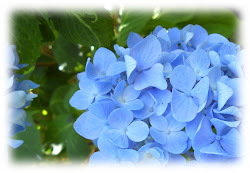 It is a happy place that will evolve with time. I'm overwhelmed with all the dies and stamps and stuff, but I love the magnetic board displaying all those wonderful dies. Having things visible is a great advantage. Enjoy your happy space...girlfriend...you deserve it. Congrats, Colleen!!! 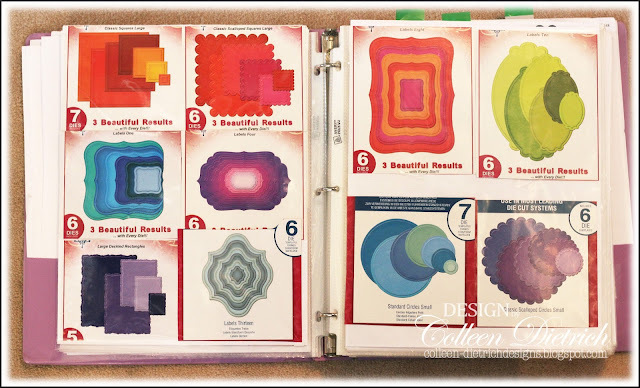 What a lovely space to make your beautiful projects!! Oh, I know you feel like you are out on the open range with so much more space than the dining room table. It's awesome to have all the wonderful storage for everything. I'm really happy for you to get your own room. I can see how the silver insulation would brighten the room. And, you can't beat the price of those curtains. 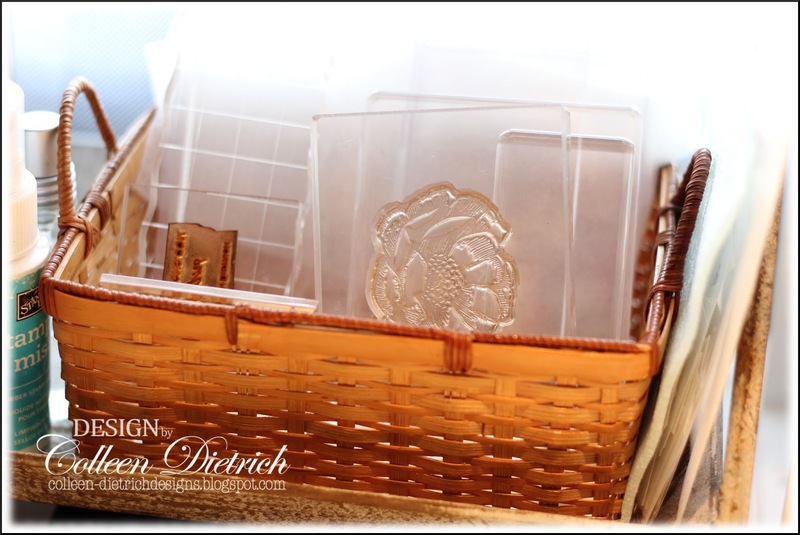 Happy Stamping in your new, wonderful space. I am so happy that you have a place to call your own!! I love the shiny foil walls!! Looks like you are in a space capsule!! With all your wonderful Ikea storage units. Thank you for sharing!!! 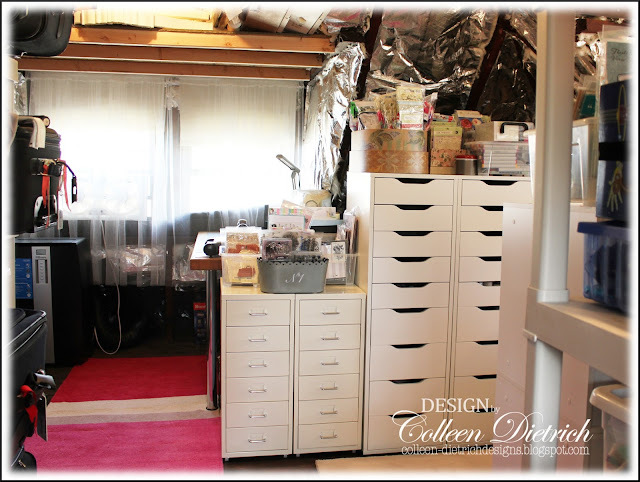 Amazing space all organized, Colleen! So happy that you have a quiet space for creating! I just love those IKEA storage pieces...swoon! 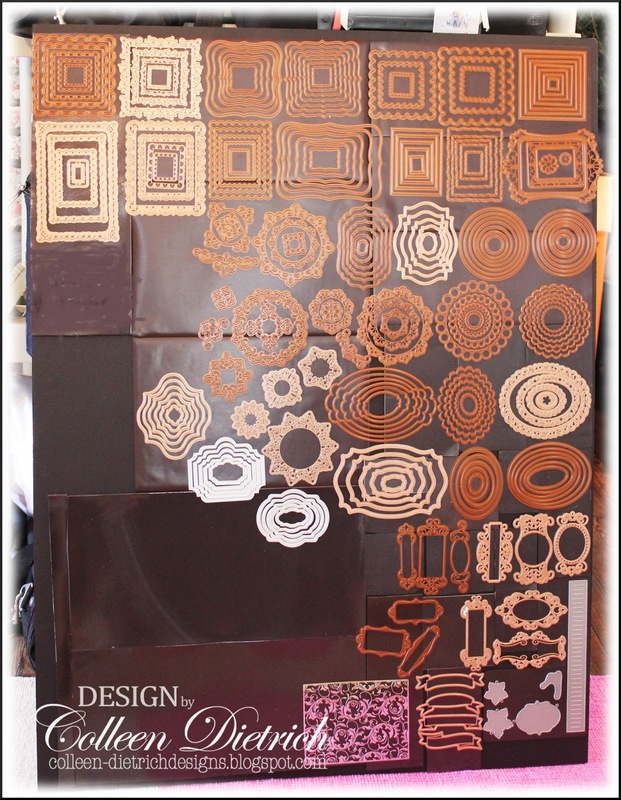 Have fun creating in your new space! Take care, hugs! WooHoo!!! Congrats girl! That is an awesome space! I have a room upstairs and when I go in and plug up my iPod I am in my little heaven. I don't have the beautiful IKEA storage units that you have. I make do with some metal shelving units that we had left over from when we sold pottery. I know you must love it! I'm envious of all that storage! I know how you must love this space, Colleen! A little home to call your own, even if you do share a bit of it with your kids. Everything has its place, so neatly stored. This must feel like Heaven after the dining room table! Knowing how long you waited for this makes me feel more appreciative of my own little stamp room. Isn't it wonderful to be surrounded by the things you love? Bet you can't wait to get up there and be crafty every chance you get! Thanks so much for a very fun tour! Holy schmoley...what an awesome space! To go from the dinning table to this is amazing! 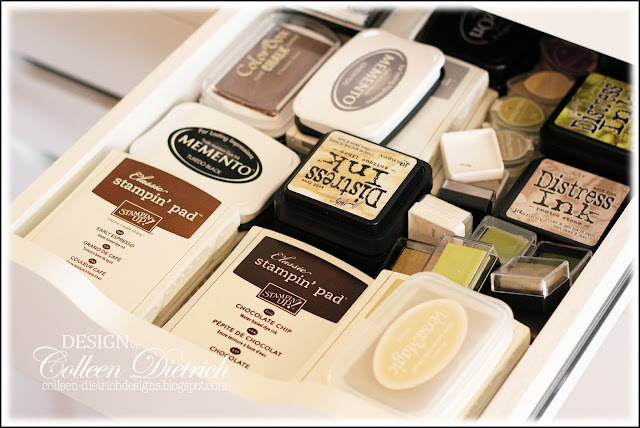 Love all your organization, cute soap boxes and tips. 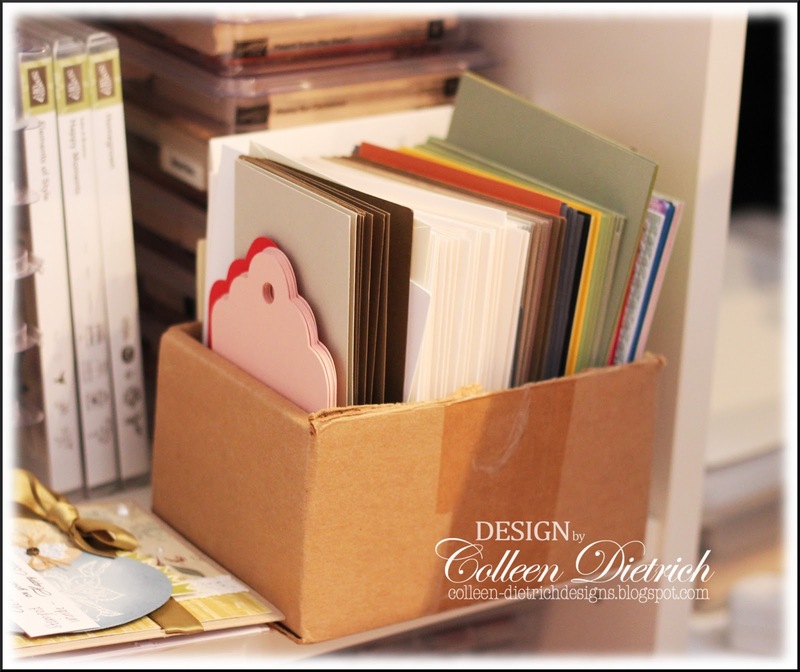 Ican't wait to see the cards that come from this creative space! Colleen, your tour was AMAZING!!! I love how you conducted it so personally. And I *thought* I recognized ALEX, HELMER, and SAMLA!! I was right!!! 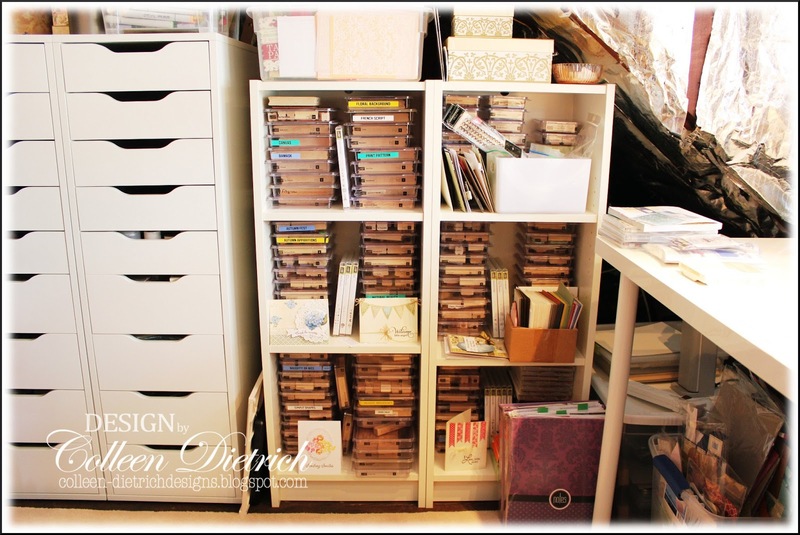 I'm sooooooooooo glad you've been able to make yourself a dedicated craft space. I know you must be so happy! How fabulous Colleen . What a great place to escape and it sounds so "creative" escaping to the attic. Hope you have many many happy hours here.You have also given me some encouragement as I though I had too many crafty goodies , but after a peak in your craft room I realise I need to buy more! PS love the tour almost felt I should sit down and have a cuppa at the end. Take care . Congrats, Colleen. I know how difficult it is to not have a craft room. 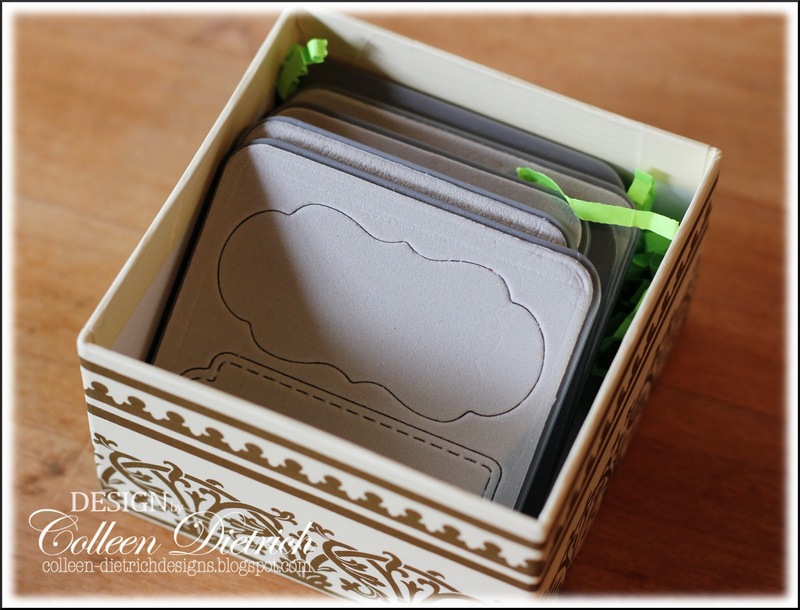 I love the way your stored your dies. My dies keeping falling every time I use one of them. And, oh. Is that the new yet-to-be-released IBS die that I see on your wall? :O Woo! It looks awesome. Can't wait to lay hands on it! Oh wow ... 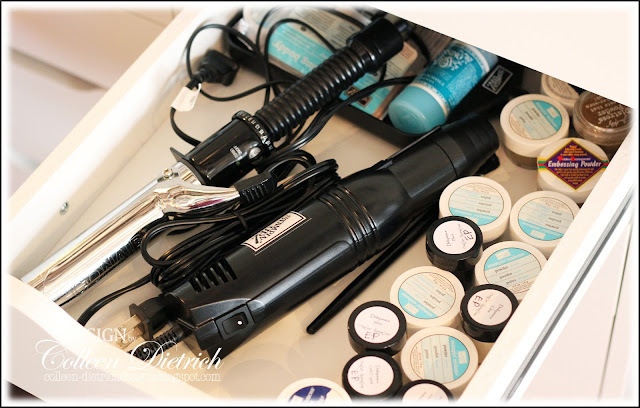 I so want to have a snoop through every drawer and space in here ... and I did so via the net.... thanks so much for sharing. You are so blessed to have such a wonderful area to be creative in. 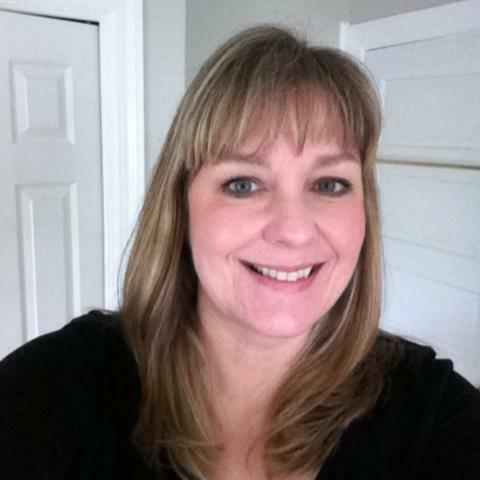 First, congrats on being Featured Stamper today. That is how I found your crafting room tour. Very well organized and thanks for sharing. 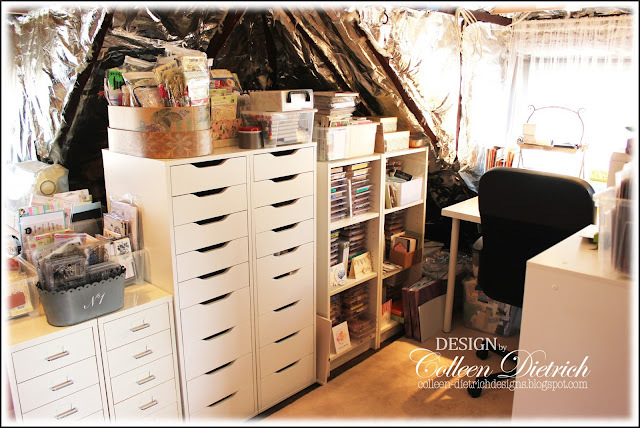 Amazing craft room...so many neat things, and you are so organized...got some good ideas from your space...thank you so much for sharing. Colleen, that was a most delightful tour! 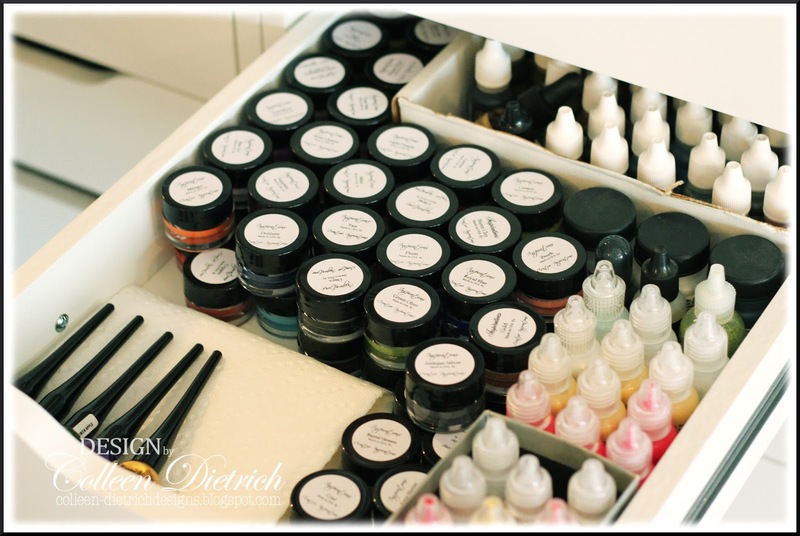 The things I love the most would be your use of containers, repurposed or purchase, for all of the wonderful products you have. Everything is so neat and within rolling distance of your work surface. Your space is wonderful! And how nice to not have to put everything away from the dining table anymore! Wonderful organization ideas!!! Thanks for sharing your space! 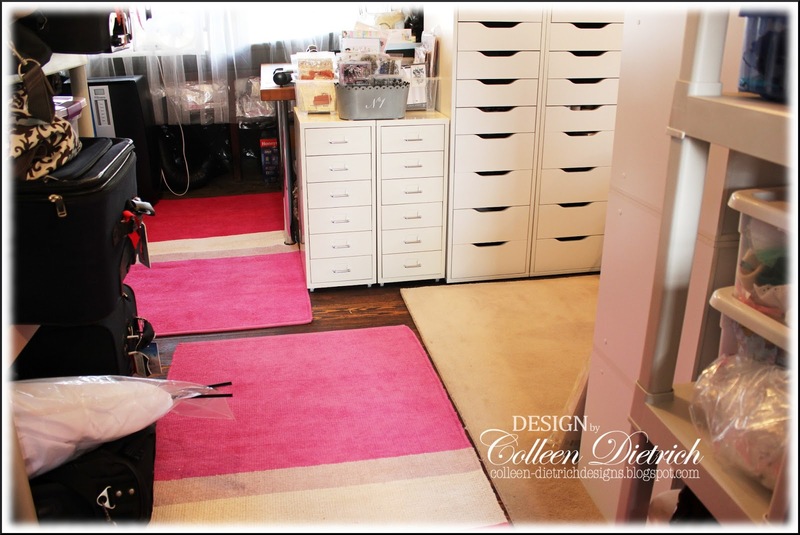 Hi Colleen, Your space has wonderful light and it's cool to get a glimpse of your organization. Happy crafting to you.